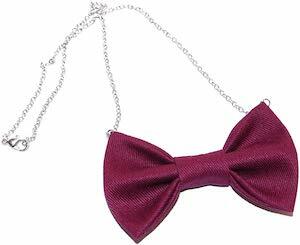 If you like a fun piece of jewelry for around your neck then you should check out this bowtie necklace. The necklace has a metal 18 inch long chain and in the middle of that you can find a fabric bow tie and you can pick a fun color and print for the bow tie. As you can pick from many colors you can have the necklace that fits perfect for the outfit of your choice. The bow is 3 inches wide making it bigger then most pendant necklaces but it really looks fun and the bow tie will stand out a bit adding some fun color.